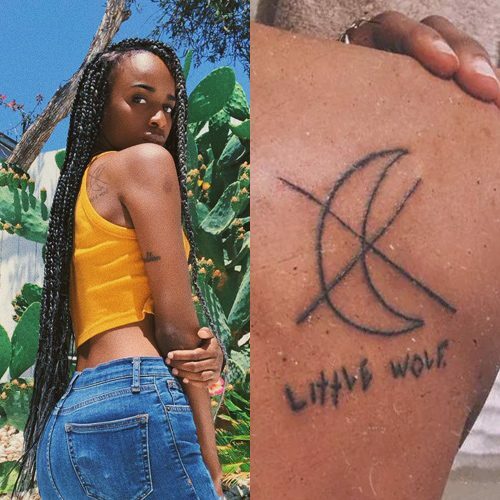 Angel Haze has a moon tattoo on her back with the words “Little Wolf”. 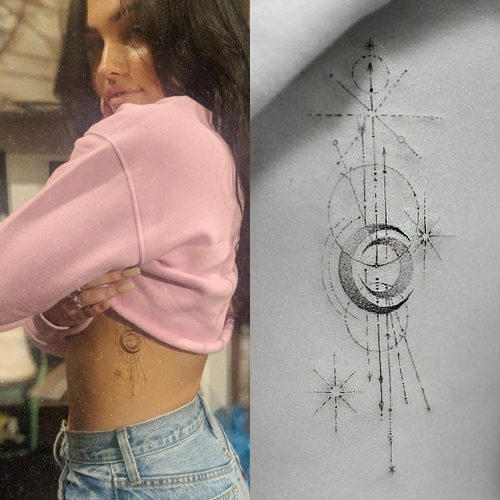 Olivia Holt has an outline of a crescent moon tattooed on the inside of her right ankle. 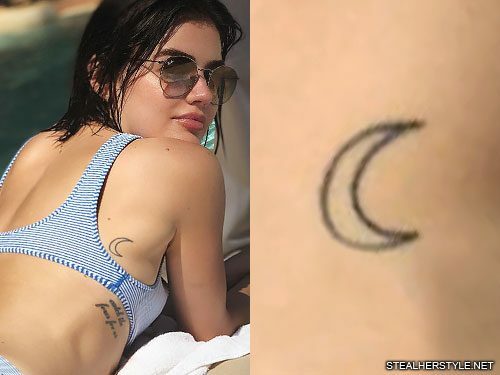 Lucy Hale has a tattoo of a crescent moon on the right side of her upper back. 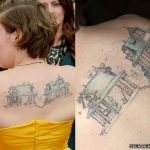 It is has no special meaning and she got it simply because she liked the way it looked. 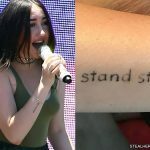 The tattoo was first seen in January 2016, but it’s usually covered by her clothing so she may have had it for a while before. I love planets, that’s like my thing….I love talking about planets, and my tour manager makes fun of me and will be like ‘you’re an astronaut today,’ and will totally make fun of me for it. So now it’s kind of turned into a joke that I just want to be an astronaut and work at NASA. 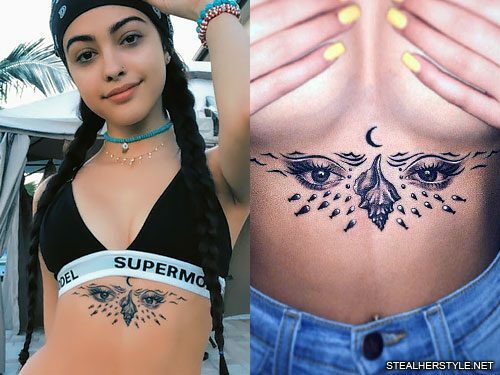 She got these first three in November 2017 and then added a heart on her pinkie in March 2018. The heart is a Cyrus family tradition, which started when they were little kids. Miley drew a heart on her dad Billy Ray’s hand and he liked it so much that he tattooed it to show his love for her. 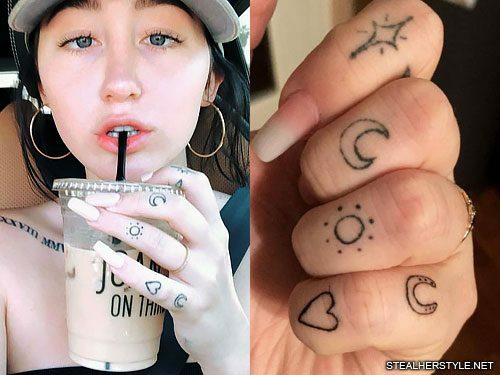 When Miley was old enough, she got her own heart tattoo on her pinkie which was inspired by his. Their mom Leticia has heart tattoos on her hand and on her pinkie finger. 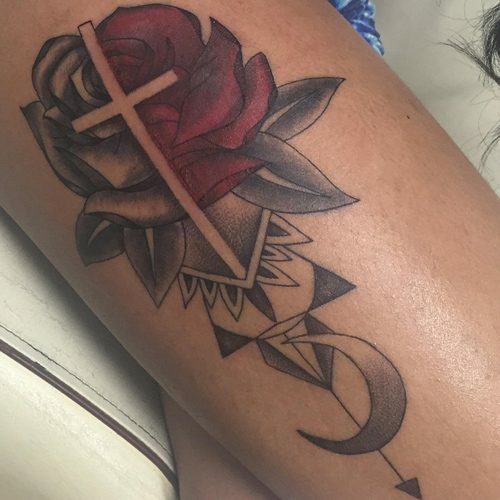 Sister Brandi and brother Trace have heart tattoos as well. While getting her heart tattoo, she also touched up the faded horseshoe on her pinkie which is a tribute to her mom. 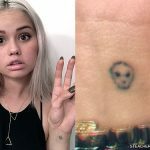 This was her first tattoo as she mentioned on her Instagram account “Anzeige * Wow got my first tattoos. I believe in the universe. I believe that you attract what you send out. I believe that energy doesn’t lie. 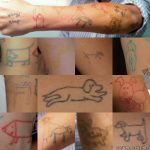 And that’s what all these tattoos mean to me ??? 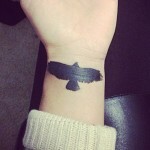 by the best of the best @jonboytattoo”. 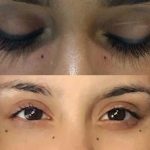 Actress Bai Ling, after struggling with booze addiction and getting out of rehab, decided to celebrate her six months newfound sobriety by getting some ink – a moon with stars on her left foot.